During summer of 2015, Space Architects began working with the University of Hull to design a masterplan for a new sports faculty on their existing campus. The University of Hull’s vision was to create a facility which provided an inviting and unique identity to the campus. The new Sports Hall opened in September which allowed work to commence on the refurbishment of the Grade 2 listed existing sports hall designed by Peter Womersley in 1963. The new design responds to the existing building which is an exemplar sports building design of its time. The sports centre development has been delivered through a staged design and build procurement process with, for each phase, Space Architects providing lead design, architect and principle design services to the University with Henry Boot acting as Principal Contractor. The new sports building consists of a three-court sports hall, strength and conditioning suite, with associated changing and storage facilities. The 70 x 36m sports hall includes seating for 750 spectators and all facilities have been designed to be fully inclusive including access for wheelchair sports teams. Construction of the sports hall began in 2017. Following the completion of the external sports and changing pavilion the project and was handed over to the university at the beginning of the university semester in September 2018. The refurbishment of the adjacent listed building commenced in October 2018. As part of the design, Space Architects developed a unique polycarbonate façade that emits soft light into the sports hall via perforations in the internal panelling. At night, the façade is backlit with a flexible coloured lighting system to create a dynamic visual beacon for the sports hub within the campus. The beacon can be adjusted in colour and sequence for events within the university campus. 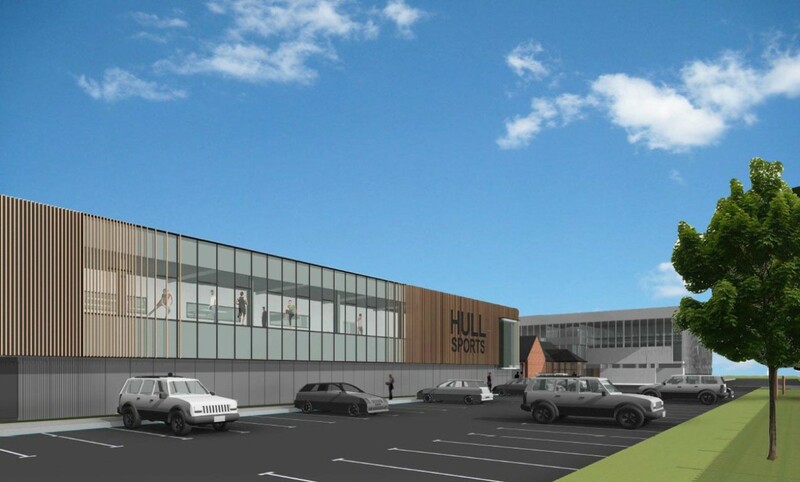 With the development of the new sporting facilities, the quality and the size of the University of Hull’s new sports centre will meet a rising level of demand amongst students whilst also offering a high-quality environment for visiting teams and users.